B.E. Meyers & Co., Inc., a manufacturer of optoelectronic products for defense and law enforcement applications, has partnered with Unmanned Systems Technology (“UST”) to demonstrate their expertise in this field. The ‘Silver’ profile showcases how their products can be used in a wide range of unmanned systems applications, such as pointing, illumination, and eye-safe and space-constrained environments. B.E. Meyers’ wide range of Infrared Pointers and Illuminators includes the NanoPoint series, available in 50, 100, 150, 200mW and eye-safe versions, as well as a two-piece Flex configuration for limited-space applications. Other lasers are available for short, medium and long distances, ranging from the compact and lightweight PicoPoint series to the very high power 3.6W UltraMark laser designed for integration into EOIR systems. The IZLID EP is a rugged, externally powered 200 mW Manual Zoom Laser designed for use in harsh environments. The laser mode can be manually set to high power, low power or pulse, and can be set up as a pointer or an illuminator by manually adjusting the divergence. The IZLID EP can also be adjusted for azimuth and elevation. Available Dual Beam Lasers include the DetectPoint series, available in 100mW pointer/500mW illuminator or 700mW versions. The near-infrared DetectPoint lasers have been designed to easily integrate into an end-use unmanned system, thus enhancing overall capabilities. B.E. 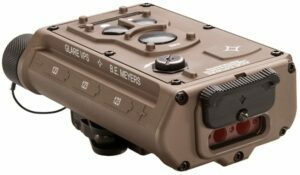 Meyers’ Visible Beam Lasers include the MilliPoint Green, a 75mW visible green direct diode laser designed with a compact form factor and featuring stability over a wide temperature range.